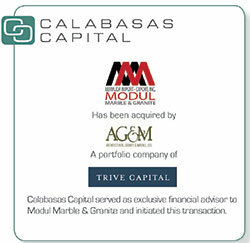 Calabasas Capital is pleased to announce the successful sale of its client, Modul Marble & Granite, (“Modul” or the “Company”) to Architectural Granite & Marble, LLC (“AGM”), a portfolio company of Trive Capital, for an undisclosed purchase price. Calabasas Capital served as exclusive financial advisor to Modul. We initiated the transaction, negotiated on behalf of Modul, quarterbacked the entire due diligence process, advised on structuring and worked closely with Modul’s CPAs, attorneys and other advisers to consummate the transaction. Modul is an importer and distributor of premium natural stone and tile products. The Company was founded almost 30 years ago and is based in Sun Valley, California. Modul has earned a pristine reputation with Southern California’s elite designers, architects, builders and fabricators as a reliable supplier of the world’s highest quality and differentiated natural stone products, including marble, granite and quartzite. Modul was founded by Mr. Osep Tokat in 1988 as a sole proprietorship and incorporated in 1990. Over the years Mr. Tokat grew the business one client at a time offering superior customer service and a broad selection of high quality stone. Mr. Akpulat became a co-owner and officer of the company in 2000 and was instrumental in accelerating the growth of the business. After working constructively as partners for 15 years, the two co-owners decided to sell the business once their business relationship was no longer productive. Calabasas Capital advised Modul on strategic alternatives and ran a sale process soliciting interest from several strategic and financial buyers. Based on a variety of factors, Modul decided to proceed with AGM. Architectural Granite & Marble, headquartered outside of Austin, Texas, is a leading importer and distributor of natural stone, engineered stone, and related products used in residential construction, commercial construction, and remodeling. From its five locations across the United States, AGM serves a national customer base, sourcing materials from around the world while ensuring high quality through a network of material inspection professionals overseas. The Company’s longstanding relationships with international quarry operators and stone slab factories help ensure availability of supply and a high level of material consistency for AG&M’s customer set, which includes leading countertop fabricators, architects, interior designers, and commercial contractors. In July 2015, Trive Capital, a Dallas-based middle market private equity firm, acquired a controlling interest in AGM. AGM was attracted to the business for a number of reasons, including most notably the strategic fit of Modul’s Sun Valley location outside of Los Angles to the AGM’s newly built-out facility in Orange County. AGM also inherited a key employee from Modul who stayed on as General Manager of the business.